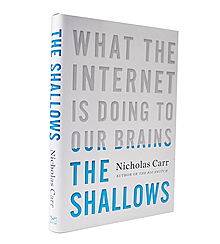 My wife and I just finished reading the book The Shallows: What the Internet Is Doing to Our Brains, by New York Times columnist Nicolas Carr. We were both moved by Carr’s page-turning assessment of how the Web has changed the way we read, think, and learn. This is not a “the sky is falling” diatribe, but a “let’s step back and see what’s really happening” shot across the bow, especially, we felt, for educators and parents. "The vital paths in our brains become the paths of least resistance—these are the paths most of us will take most of the time, and the further were proceed down them, the more difficult it becomes to turn back. "Because language is, for human beings, the primary vessel of conscious thought, particularly higher forms of thought, the technologies that restructure language tend to exert a the strongest influence over our intellectual lives (the Web and social media). The history of language is also a history of the mind. "The Net is a Turing machine of immeasurable power and it is, true to form, subsuming most of our intellectual technologies. It's becoming our typewriter, our printing press, our map, our clock, calculator, or telephone, our post office, library, radio, and television. Rarely have we paused to ponder, much less question, the media revolution that has been playing out all around us, in our homes, our workplaces, and our schools. "It turns us into lab rats, constantly pressing levers to get tiny pellets of social or intellectual nourishment. Our use of the Internet involves many paradoxes, but the one that promises to have the greatest long-term influence over how we think is this one: the net seizes our attention only to scatter it. "Our research results suggest that learning facts and concepts will be worse if you learn them while you're distracted. The Net's cacophony of stimuli short-circuits both conscious and unconscious thought, preventing our minds from thinking either deeply or creatively. Our brains turn into simple signal-processing units, quickly shepherding info into consciousness and back out again.